Food systems encompass all activities connected with food: growing, harvesting, processing, transport, distribution, marketing, preparing, eating and even throwing away unused food. A sustainable food system is one that functions without harming the environment, gives farmers a fair return for their efforts, minimizes food losses and waste, and ensures that everyone has access to enough nutritious food. WHAT IS THE WORLD FOOD DAY POSTER CONTEST? The contest gives children a chance to express their ideas about food and hunger, and share their creative visions with the world. Posters may be digitally created, drawn, painted or sketched using pens, pencils, crayons or charcoal, or using oil, acrylic or watercolor paint. Three winning posters will be selected in each of three age groups: 5-to 8-year-olds, 9-to 12-year-olds, and 13- to 17-year-olds. On World Food Day (16 October). All winners will receive the popular “EndingHunger movement” T-shirt and a Certificate of Recognition signed by a United Nations official. First-place winners will also receive a special surprise gift! WHERE WILL THE POSTERS APPEAR? All eligible entries will be published in a gallery on the official World Food Day website. Individual poster entries can be “liked” or shared via Facebook, Twitter and Pinterest. In addition, the top posters in all three categories will be promoted on both the World Food Day and EndingHunger websites and social media. Posters will be judged on originality, artistic ability and expression of the theme. Each of the three age groups will be judged separately. The panel of judges will include professionals working in the arts, education and humanitarian assistance. >> Entries must be original and should not include signature, photographic images of the contestant, or other identifying information. >> Only digital files in JPG format can be accepted. >> Maximum allowable file size is 1.5 MB. 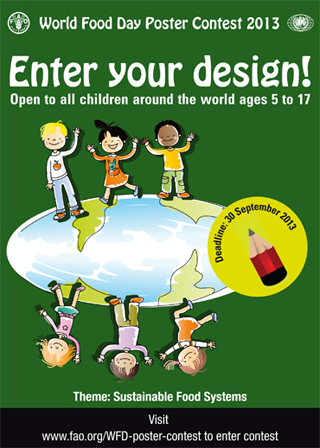 >> Entries must be submitted through the World Food Day Poster Contest webpage. Emailed entries will NOT be accepted. >> Deadline for entries: 30 September 2013. The Food and Agriculture Organization of the United Nations (FAO) leads international efforts to end hunger. FAO helps developing countries and countries in transition to modernize and improve their agriculture, forestry and fisheries practices. Since its founding in 1945, FAO has focused particular attention on developing rural areas, which are home to 70 percent of the world’s poor and hungry people. 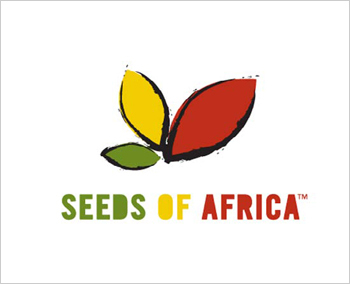 FAO is present in over 100 countries around the world, and is headquartered in Rome, Italy. For more information: www.fao.org. The United Nations Women’s Guild (UNWG) is a voluntary organization of women connected with the United Nations, working for the benefit of needy children around the world. The Guild, a non-profit and charitable organization, has been sustaining small programs and raising funds for children in need mainly in developing countries for over 63 years. An agricultural cooperative, also known as a farmers’ co-op, is a business that enables its members to make money while also providing benefits for the group. Farmers working together as a team can achieve things that would otherwise be impossible. For example, a group of people working together to grow vegetables or fruit, to fish together or simply to sell something collectively can benefit by sharing materials, experience and other resources. WHAT’S THE WORLD FOOD DAY POSTER CONTEST? FAO and the United Nations Women’s Guild in Italy have launched the first international World Food Day poster contest for children from 5 to 17 years of age. Children from all over the world are invited to use their imagination and artistic talent to create a poster illustrating the World Food Day theme: “Agricultural cooperatives – key to feeding the world.” This contest gives children an opportunity to express their ideas about hunger and share their creative visions with the world. Posters can be digitally created, drawn, painted or sketched using pens, pencils, crayons or charcoal, or using oil, acrylic or watercolor paint. Three winning posters will be selected in each of the three categories: ages 5 to 8, ages 9 to 12, and ages 13 to 17. On World Food Day, 16 October 2012, the top three posters in all three categories will be published on the World Food Day website, through FAO’s Facebook page, and with the worldwide entire EndingHunger movement. Winners will also receive Certificates of Recognition signed by a United Nations official. The first-place winner will receive the popular EndingHunger T-shirt along with a special surprise gift! Entries must be original and should not include signature, photographic images of the contestant, or other identifying information. Participants should submit one entry. Only digital files in JPG format can be accepted. If a digital photo is submitted, it must be at least 530 pixels wide and 375 pixels long. The maximum allowable file size is 1.5 MB. 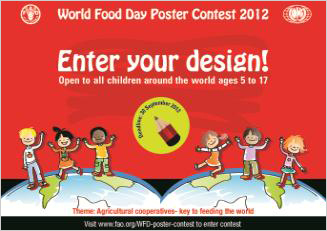 Submissions must be made online on the World Food Day Poster Contest webpage and are due by September 30, 2012.
fao.org. For more information on rules and prizes, please visit fao.org / contest-rules. The United Nations Women’s Guild (UNWG) is a voluntary organization of women connected to the United Nations that works for the benefit of needy children around the world. The Guild, a non-profit and charitable organization, has been sustaining small programs and raising funds for children in need mainly in developing countries for over 63 years. As he advances into his septuagenarian period, a thought came to me. That by the time of his physical passing, at the age of thirty-six, he had acquired the wisdom of an elder. Snow began to fall on the first night of the Bob Marley Festival (4th February), blanketing everywhere. So it was a welcoming change, to walk into a place of red, gold and green. A warming décor, to take away the chill and introduce the evening. Although some were put off or blocked by the weather, I believe those who gathered and filled out the Bullingdon Arms, received a full blessing. Natty Hi-Fi stalwarts, Garvin Dan and Nico, treated us to a selection from the Bob Marley treasure box; interspersed with music from other great talents, concluding with gems from Bunny Wailer and Peter Tosh – his childhood friends and founder members of the Wailers. Classics; early and later recordings. Plus their dubs, instrumentals and versions. A real panorama of his art. If my ears could applaud, they would have joyfully clapped, for what they received that night. I never tire of listening to his music, nor does my son Bingy, five years old. Like prayer, his music is forever. We left the Bullingdon at 3a.m, face and spirit glowing, looking forward to part two. Yesterday, Sunday, day two of the festival, which began at 1pm and was held in the Chester Arms; began for me with coconut dahl and peas and rice. A generous portion of great-tasting food, created by Pippa a.k.a Little General, a popular local caterer. After this culinary delight, came the musical ones. These gifts of sound were given to us by Tony Dread, original Natty Hi-Fi DJ; Prince, who blessed us with selection as well as his own poetry: Two In One, featuring Nick and his daughter Delilah; Jah Paul and Keolan Roots; plus the resident, Garvin Dan. Because it was a daytime session, finishing at 8pm, children were able to enter. Some played outside in the snow, with swings, see-saw and a slide. Others inside, chatting and dancing with their parents. Due to their enjoyment the night before, Jamatone volunteered to play for free. A respectful gesture, especially as the featured live act, Ras Keith, couldn’t make, it due to illness. Because of a late arrival, they were only able to play a short set. Short but sweet. Including such highlights as the two vocalists, Bissy and Shumba, duetting on one of my favourites ‘The Way They Treat I’. Always good to have Jamatone around – our Combination Dub. Before I finish, mention must be made of Simone Hendry, a film-making student at City and Islington College, London. She has set up her own company, called Toxic Productions. It was her and crew who filmed the whole proceedings, moving around with tripod and cameras. Hoping to catch the festive spirit on film; for us all to share and savour, in time to come. At the end, volunteers helped to take down the hangings and to carry out the sound system. I think Bob Marley would have liked to have seen that. As well as the little children, dancing to his music. This ghetto youth, whose music and life, is now studied by students, writers and academics, became wise beyond his years. A simple living sage, whose greatest love was music. Wise enough to understand it’s power and to harness it: and then to heal us with it. Blessings for everyone. Today, the sixth of February; I wish you a very Happy Birthday Bob Marley, 72 years old. Well known for his comic and satirical story telling Alemayehu Tefera will be launching his Comic book “Abeshania” at Flamingo Restaurant (In Amharic). Amongst our community his artwork triggers a powerful sense of recognition and nostalgia. By merging Ethiopian colours and forms with modern art techniques, Alemayehu brings you a well thought out social commentary on Ethiopian society both at home and abroad. The event will be kicked off with a brief introduction by Alemayehu, which will be followed by a Q&A session, poetry and short animation. The inspiring traditional singer Zewditu Yohannes accompanied by the delightful Girma Tefera Kassa will present music from Ethiopia. For the more modern ears, DJ Nice will be at hand to spin the right tunes! Do not miss this unique event. photo & design: admassu m. k.
Lissan Magazine and Offenes Haus der Kulturen invite you to be part of this season closing event. Don’t miss it if you are somewhere near Frankfurt on Saturday February 12. 2011. We have great dance music, affordable beverages and delicious traditional food. All you need is to be there and enjoy the multicultural party atmosphere. The entrance is only 3 Euro (A symbolic fee to cover our expenses). Addis Ababa’s first International Photography Festival, directed and curated by Aida Muluneh, photographer and director of the Modern Art Museum-Gebre Kristos Desta Centre, will take place from December 7th to 11th 2010. The first edition of ADDIS FOTO FEST will bring together African and African Diaspora photographers, in order to foster a dialogue through various events and workshops. With the participation of representatives from the global photography market, the activities of the festival will be an opportunity to expose the participants to the various ways in which images of Africa are produced, negotiated, and marketed. Every day of the festival, multiple events will be taking place, from training to exhibition, and from discussion to screening, offering a wonderful opportunity to engage with international photographers and curators. Three residency programs, with Akinbode Akinbiyi (Nigeria), Yo-Yo Gonthier (France) and Dawit L. Petros (Canada), have already started off activities in November These residencies will lead to exhibitions opening during the festival. In total, over a dozen shows will be opening during the week of celebrations, starting with a group exhibition titled “Ethiopia: Interior Visions” featuring eight photographers from various parts of the world with a focus on Ethiopia. In addition, the opening will feature a tribute to legendary photographer Shemelis Desta, who will be in attendance. . The festival is not only about displaying and screening images, it will also include a closed portfolio review organized by the Goethe-Institut of South Africa. The reviews will bring together twelve emerging photographers from around the continent, whose work will be reviewed by celebrated curators such as Simon Njami and Chris Dercon. The 40 participants flying in from 18 different countries will also gather in the Institute of Ethiopian Studies for 2 panel discussions on ethics and standards of photography in Africa, with the participation of the Ethiopian artistic and media communities. 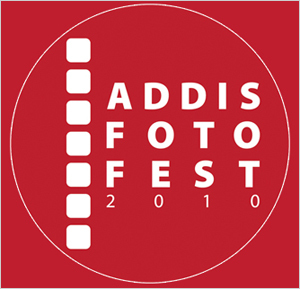 ADDIS FOTO FEST is supported by the African Union and the delegation of the European Union to the African Union, the Addis Ababa University, the Spanish Cooperation (AECID), the Prince Claus Fund, the British Council, the Goethe-Institut, the Alliance éthio-française and CulturesFrance, the Heinrich Böll Foundation and the Canadian Embassy, as well as private companies. Against the political and historical events that defined the twentieth century, Shemelis Desta recorded the tumultuous history of Ethiopia. For the first time in a major exhibition the key figures and moments he captured are revealed. From the early 60s until deposition Desta was Haile Selassie’s, Emperor of Ethiopia 1930 – 1974, official court photographer. During this time he took photographs of state leaders, including a youthful Queen Elizabeth II, paying their respects. Following the infamous 1974 military coup and subsequent deposition of the Emperor, Desta continued to record government activity under the rule of the military dictator, Mengistu Haile Mariam. Desta captured the colourful pageantry of state military processions as well as a state visit from Fidel Castro. Akinbode Akinbiyi was born of Nigerian parents in Oxford, England, in 1946. Today he lives in Berlin, working almost worldwide from there. His school and university experiences reach from Nigeria to England and Germany. He took his B.A. Degree in English at Ibadan University, Nigeria. 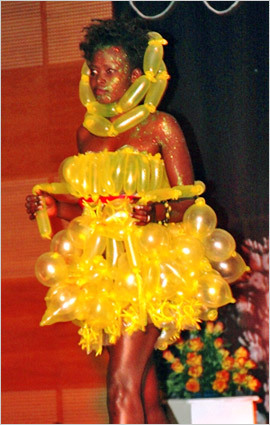 Akinbode has been working as a freelance photographer since 1977. He got a STERN reportage grant to work in the cities of Lagos, Kano and Dakar in 1987 and was co-founder of UMZANZSI, a cultural center in Clermont Township in Durban, South Africa, in 1993. Akinbode Akinbiyi’s main photographic interest focuses on large, sprawling mega cities. He is working on the four biggest cities on the African continent – Lagos, Cairo, Kinshasa and Johannesburg -, aiming at spreading these topics through serious art books and exhibitions. Akindbode has taken part in many international exhibitions and his publications have been printed worldwide. He also works as a curator and leader of photographic workshops. Yo-Yo Gonthier was born in Niamey, Niger, in 1974. He graduated with a Masters in Photography and Multimedia from Paris VIII University in 1997 and has since been working as a freelance photographer, primarily based in Paris. The object of his work is the erasure of memory in a western world where the essential values seem to be speed, progress and technology. He seeks the sense of wonder, in a tension between attraction and repulsion, bringing his own interpretation to night-time photography and the use of light and dark/chiaroscuro. His nocturnal studies have already provided the material for several exhibitions, including Les lanternes sourdes, a study of shuttered dark lanterns, in 2004. He is also interested in the remnants of France’s colonial past, investigating the friction between history and memory. This ongoing project already gave rise to a preliminary exhibition entitled Outre-mer at the Espace Khiasma, Paris, in June 2008. Yo-Yo Gonthier is also involved in a number of multimedia workshops, both in schools and hospitals. He is currently artist in residence at St Exupery middle school near Paris, working on the La Peau de la lune project on the theme of fligh. He recently completed a commission for the Parc de la Villette, Paris for the 2009 Kréyol Factory exhibition and currently participates in the Biennial of African Photography, in Bamako, Mali. Dawit L. Petros was born in Asmara, Eritrea, and received his MFA in 2007 from the School of the Museum of Fine Arts, Boston. He was a 2008-2009 Artist-in-Residence at the Studio Museum in Harlem. He has exhibited his work in group shows throughout Canada and in the United States, including the Studio Museum in Harlem, New York; Wedge Curatorial Projects, Toronto; the Museum of Contemporary Art Detroit; Photographic Resource Centre, Boston; Massachusetts College of Art, Boston; Harbourfront Gallery, Toronto; Observatory 4,Montreal; Maison de la Culture Frontenac, Montréal; and Prefix Gallery, Toronto. He has received fellowships, as well as an Art Matters Foundation grant. Zach Abubeker is a photographer living and working in Chicago. He attended Columbia College Chicago, where he attained his BFA in Photography. He has recently shown at The Center Gallery in Wichita, Kansas, as well as in Columbia College’s BFA/BA photography exhibition. His work explores ideas of self-identity and the intermingling of race and culture. He plans to pursue an MFA in studio art within the next two years. Simon Njami is an independent lecturer, art critic, novelist and essayist. He lives in France, and has Cameroonian roots. He was also a consultant in visual arts for the Association Française d’Action Artistique and co-founder and editor-in-chief of the cultural magazine “Revue Noire”. Njami has been the artistic director of the Bamako photography biennale, and was co-curator with Fernando Alvim of the first African pavilion at the 52nd Venice Biennale in 2007. He has curates numerous exhibitions of African art and photography, including Africa Remix and the first African Art Fair, held in Johannesburg in 2008, and most recently, “A Useful Dream” at the Palais des Beaux Arts in Brussels, to celebrate the 50th anniversary of African indenpendences in the framework of the Visionary Africa festival. Endalkachew Tesfa was born November 14/1952 in Addis Ababa, He did his primary education in Ethiopia and his secondary education in the US. He then attended the Montgomery Community College school of communication where he developed interest in photography; later he attended Corcoran school of Art in Washington DC, concentrating on Photography. After Corcoran Endalkachew attended several photography classes at the US Department of Agriculture where he specialized in commercial photographing of products and establishments. To name a few, Endalkachew and partner Andarge Asfaw established F/Stop studio in Silver spring MD and worked with companies like Black & Decker, Mobil and other major companies, and later worked for a major retail studio (Sears Portrait Studio) as a studio photographer then as a studio manager, until promoted to district manager in Washington DC area, Philadelphia and Delaware, before moving back to Ethiopia . He currently works in a family printing and publishing business and has been the General manager for the past 13 years. Amongst others, Endalkachew has exhibitied at the Smithsonian Institute and Adams Morgan day, Washington in Group exhibitions and at Asni Gallery , Addis Ababa , in 2000 for a Solo Exhibition. Grace Ndiritu was born in 1976 in Birmingham and lives and works in London. She studied at Winchester School of Art, London; De Ateliers, Amsterdam; and had a UK studio residency at Delfina Studios, London (2004-2006). Her ‘Hand-crafted videos’ and ‘Video Paintings’ have been widely exhibited, recent solo shows at the Chisenhale Gallery, London (2007), the 51st Venice Biennale (2005) and Ikon Gallery, Birmingham (2005) Recent group shows include those at the International Center of Photography, New York (2009), Studio Museum Harlem, New York (2008), Dakar Biennale, Senegal (2008) and Metropolitan Museum of Art and Grey Art Gallery, New York (2008). Born in Madagascar from a franco-malagasy mother and a Chinese father, Pierrot Men (which literally means “light” in Chinese) is a photographer. Laureate of the Mother Jones International Fund Documentary Photography and winner of the Leica prize (USA), his photographs are regularly exhibited worldwide: from Paris to Brussels, Bamako, Las Palmas or Algiers, through Antananarivo or Saint-Denis de La Réunion. He lives and works on the island. He is also the founder and manager of a photo lab that bears his name. Salim Amin, an only child of Mohamed “Mo” Amin, undertakes a journey into the life of the frequently absent, globetrotting father he loved, revered and feared. In his late teens, Mohamed Amin abandons his studies to pursue a career in photography, which, over the course of thirty years, will turn him into a frontline cameraman extraordinaire – and, arguably, the most renowned photojournalist of his era. Dudley M. Brooks became a photographer, he says with a laugh, because he “refused to get a real job.” “Being a photographer gives you a license to go out and see how people live,” says Brooks. “And in order for us to learn about each other, we have to see how other people live.” From the psychedelic fury of an all-night rave dance party to roommates clowning around at the Laundromat, Brooks captures the motion and energy of the world at large. Brooks has been with The Post since 1983. He is the Senior photo director at Ebony magazine. Antonio Fiorente is a photographer living and working in Addis Ababa, Ethiopia. Working in both the commercial and artistic sectors he is best known for his ‘life’ and documentary work, which focuses on the people and landscape of rural, tribal Ethiopia, fiercely revealing the other side of this culturally enriched nation, whose tarnished image of drought and poverty dominate worldwide perception. His work seeks to explain and express the situation; communicating the artistry of the photographer, the skills and knowledge existing behind the camera giving the photo identity. He has been exhibited worldwide and achieved critical accreditation, achieving the 2003 4th African Press Photo Award. Mark Sealy has a special interest in photography and its relationship to social change, identity politics and human rights. In his role as director of Autograph ABP he has initiated the production of well over 50 various publications, produced exhibitions worldwide, residency projects and commissioned photographers globally. During his time with Autograph ABP, Sealy has jointly initiated and developed a £7.96 million capital building project (Rivington Place) in partnership with the Institute of International Visual Arts. This is the first new build visual arts project to be built in London for over 40 years. He has guest lectured extensively throughout the UK and abroad including The Royal College of Art and currently at Sothebys Art Institute where he lectures on the subject of global photography. He has written for the several international photography journals, including most recently for Foam Magazine. He has severed as a jury member World Press Photography and Sony’s World Photography Competition. Sealy’s most recent large scale curated project was “Disposable People: a Hayward Gallery Touring exhibition which opened at Royal Festival Hall in London Oct 08 and toured nationally throughout 2009 the was viewed by over 450,000 people, and the first one person show for Sammy Baloji in London. His book project with Phaidon Press Limited titled “Different” on photography and identity produced with Professor Stuart Hall has received critical acclaim. In 2007, Sealy was awarded the Hood Medal for services to photography by the Royal Photographic Society. He is currently a PhD candidate at Durham University. His research focuses on photography and cultural violence. He is currently working on a major photography show for Ryerson University in Toronto, Canada which will examine issues of representation and human rights due to open in 2012. Born in Brooklyn, Shabazz is a photographer, youth activist and long time member of the New York City Department of Corrections. Active as a photographer since age 15, he came to prominence with the publication of his first book, Back in the Days (2001), a document of New York’s early hip hop scene (1977-82). He has since published two further books, The Last Sunday in June (2003) and A Time Before Crack (2005). Ken Johnson, writing in the New York Times, has described Shabazz as “the best kind of photojournalist: one driven simply by curiosity about other human beings”. Jamel Shabazz lives in Long Island, New York. Sammy Baloji was born in 1978 in Lubumbashi, Democratic Republic of Congo, where he still lives and works. After graduating in Literature and Human Sciences at the University of Lubumbashi, he started out doing cartoons and then turned to video and photography. At the beginning, he focussed his work on ethnography and body expressiveness. Later he has become interested in the cultural heritage of Katanga, his province, and particularly in its colonial architecture. He has taken part into many different projects and his films and photos have been shown in several international exhibitions. more time in India and Nepal, studying North India Classical Music. From 1993 to 2000 he lived in Eritrea working as teacher at Italian School of Asmara, visiting at the same time, Ethiopia, Egypt, Lesotho and Yemen. He exhibited his photos in more than 130 exhibitions, in Italy, Croatia, Slovenia, Hungary, France, Austria, India, Eritrea and Russia. Rosa Verhoeve lives and works in Amsterdam, the Netherlands. She graduated in Sculpture/Autonomous Works from the Rietveld Art Academy Amsterdam in 1995. After her graduation, while living in a rural community in France for seven years, she discovered the powerfool tool of photography. She became the villagers’ storyteller ithrough images, and has been a storyteller ever since. Rosa worked in Europe, Africa (Ethiopia, Kenya, Sudan) and Asia. She has a special relationship with Indonesia, because both her mother and grandmother originate from Java, Indonesia. Recently she has been working on a personal photo project called Kopi Susu (Coffee with Milk) in Indonesia and the Netherlands, about her mixed origins. Rosa taught photography in Kenya, Ethiopia and Indonesia and is currently teaching Documentary Photography at the Dutch Fotovakschool. 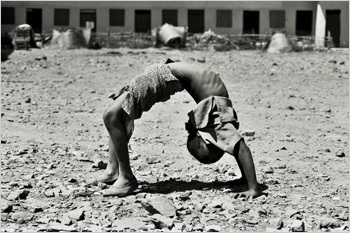 In 2006 she won the national Zilveren Camera (Art category) for her series “Salto Vitale” about Ethiopian youth circuses. In 2009, Christian Caujolle (Agence VU) selected her series TB+, about tuberculose in Sudan, for the international exhibition Stop TB. Chester Higgins is one of the premiere photographers of his generation. Because he believes art humanizes us, the subjects of his photographs are of utmost importance to him. His images resonate with a spiritual echo, which maintains the image and frees it from the constraints of time. Much of Higgins’ imagery is inspired by his quest to redefine the visual document as it relates to people of African descent. Viewers gain a rare insight into cultural behavior — a window to another place and time — through his portraits and studies of living rituals and ancient civilizations. An Alabama native, he has been a staff photographer for The New York Times since 1975. His photographs have appeared in numerous publications including ARTnews, New York Times Sunday Magazine, Life, Newsweek, Fortune, Time, Ebony, Essence, The New Yorker and Archaeology. His solo exhibitions have been hosted by International Center of Photography, The Smithsonian Institution,The Museum of African Art, The Museum of Photographic Arts, The Schomburg Center, among others. He is the recipient of grants from The Ford Foundation, the Rockefeller Foundation, the International Center of Photography, the National Endowment for the Arts and the Andy Warhol Foundation (ICP). Over the past five decades, Higgins has produced six books of compelling images reflecting a sensitive and in-depth diary of his explorations of the human Diaspora. Jean-Baptiste Eczet is a french anthropologist who works in the lower Omo valley since 2006. His interest lie in the conception of the individual which is expressed, among the Mursi, through several aesthetical manifestations: body ornamentations, names and poems. His photographic work can be seen as complementary to his anthropological research: his pictures show attitudes that go beyond a cultural determination, the persons behind the individuals. Nick Danziger was born in London but grew up in Monaco and Switzerland. He developed a taste for adventure and travel from a young age and, inspired by the comic-strip Belgian reporter Tintin, took off on his first solo trip to Paris aged 13. Without a passport or air ticket he managed to enter the country and travel around, selling sketches to make money. Nick’s initial ambition was to be an artist, and he later attended The Chelsea School of Art, where he gained an MA in Fine Art and was soon represented by the Robert Fraser Gallery. Nick has spent much of the last 25 years photographing the world most dispossessed and disadvantaged. More recent photography projects have included a study of the impact of armed conflict on women and travel to eight of the world’s poorest countries to meet individuals living in extreme poverty. The aim was to document the progress being made towards meeting the eight ‘Millennium Development Goals’ set by the United Nations to eradicate poverty by 2015. On this day, November 2, 80 years ago in 1930, Haile Selassie was crowned Emperor of Ethiopia at the Cathedral of Saint George in Addis Ababa, Ethiopia. 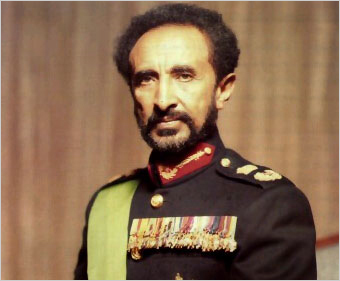 Ethiopia’s last Emperor, Haile Selassie, was born on July 23, 1892. He is generally regarded as the father of African unity and the face of the Pan-African movement. Emperor Haile Selassie reigned for 43 years and 314 days and was one of the world’s most well regarded leaders during his era. Loved by some, hated by others, Emperor Haile Selassie’s unflagging commitment to Africa’s independence movement and to strengthening the African diaspora should be recognized by all Ethiopians, Africans and people of African descent worldwide. It has been 118 years since Teferi Mekonnen, His Majesty’s given name, was born in Eastern Ethiopia. He died on August 27, 1975 in unknown circumstances after being put under house arrest by the military-run Government of Ethiopia that reigned from 1974 until 1991. After the Emperor’s corpse was buried under his bathroom, his remains were excavated in 1991 when Northern rebels toppled Colonel Mengistu Hailemariam’s Government. In 2000, a formal funeral was given to Emperor Haile Selassie presided by the Patriarch of the Ethiopian Orthodox Church, although the current Government of Ethiopia was reluctant to recognize the Emperor’s formal burial as a State Funeral. The work of Marcus Garvey, Bob Marley, Kwame Nkrumah, Jomo Kenyatta and many others was inspired by the leadership and statesmanship exhibited by the “Lion of Judah.” Emperor Haile Selassie is also responsible for expanding the foreign bases of the Ethiopian Orthodox Church and promoted literacy and advancement within Ethiopia and the African continent. As a founding father of the Organization of African Unity, now African Union, he was a resounding pillar to the sovereignty of the continent. The Ethiopian Global Initiative is going to work with the Crown Council of Ethiopia to organize a yearlong celebration of the legacy of Emperor Haile Selassie from July 23, 2011 until July 23, 2012, culminating in a celebration in Addis Ababa in honor of what would have been his 120th Birthday. EGI wants to celebrate the life and achievements of the Emperor as it relates to the Pan-African movement that he helped engineer. It is imperative that we work in collaboration with the Crown Council of Ethiopia and other Ethiopian cultural, youth and civic organizations both within Ethiopia and abroad so that the Emperor’s birthday celebration may be inclusive and appropriate. One important way EGI will celebrate the legacy of Emperor Haile Selassie is by undertaking a global “Haile Selassie 120th Birthday Day of Service” that will include Ethiopians and non-Ethiopians giving back to their local communities. Whether it is cleaning a park, reading to children or cooking food for the homeless, the “Haile Selassie 120th Birthday Day of Service” would strive to celebrate the work of the Emperor. The service events would be held on July 23, 2011 simultaneously throughout the world. Participants would be able to post their pictures, photos and blog articles to a central website that would strive to showcase the legacy of the Emperor on the African diaspora. The “Haile Selassie 120th Birthday Day of Service” will launch a yearlong celebration of the Emperor’s life and achievements. To get involved please email: info@ethgi.org or call +1-617-528-9434. Join apexart as we imagine our way to the Ethiopian countryside to hear actress Azeb Worku Sibane perform “The Devil’s Scarf” and “The Lion’s Whiskers.” Traditionally in Ethiopia, neighbors gather in the house of the oldest man of the village for an evening of coffee, kolo (a snack of salted grains), areke (a locally produced alcohol) and story telling. The crowd eats and drinks until the performance begins, when food and drink are forgotten. Here audience members will be encouraged to join in the telling of the story, through clapping and advice to the characters in the story. Azeb Worku Sibane lives in Addis Ababa, Ethiopia and has worked professionally for more than fifteen years in diverse roles including actress, production manager, translator, theater director and playwright. Azeb has performed at Ethiopia’s National Theatre since 1992 and has appeared in productions such as “Ha -hu weyim Pe-Pu” by Laureate Tsegaye G/medhin and “Keadmas bashahge” by Bealu Girma. 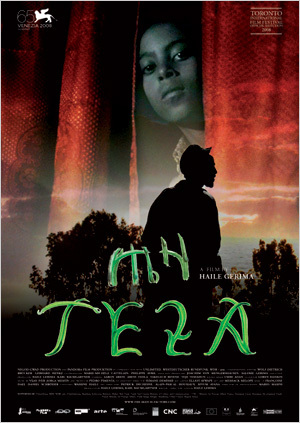 In 2006 Azeb directed and acted in “Eight Women,” originally a French comedy drama that she translated to Amharic. This was the first theater production in Ethiopia to be staged entirely by women. Additionally, Azeb has performed in numerous plays at the Addis Ababa Cultural Center, and in live transmissions at the Ethiopia National Radio. 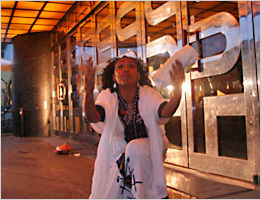 In 2007 Azeb Worku performed at The Swedish Theater Biennial in Örebro as part of the Performing Arts Cooperation between Sweden and East Africa (PANCSEA).